This first fascicle updates The Art of Computer Programming, Volume 1, Third Edition: Fundamental Algorithms, and ultimately will become part of the fourth edition of that book. 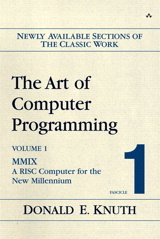 Specifically, it provides a programmer's introduction to the long-awaited MMIX, a RISC-based computer that replaces the original MIX, and describes the MMIX assembly language. The fascicle also presents new material on subroutines, coroutines, and interpretive routines.